April 16, 2012 By arzea 16 Comments This post may contain affiliate links. Read my disclosure policy. People that know me, know that I LOVE Mexican food. 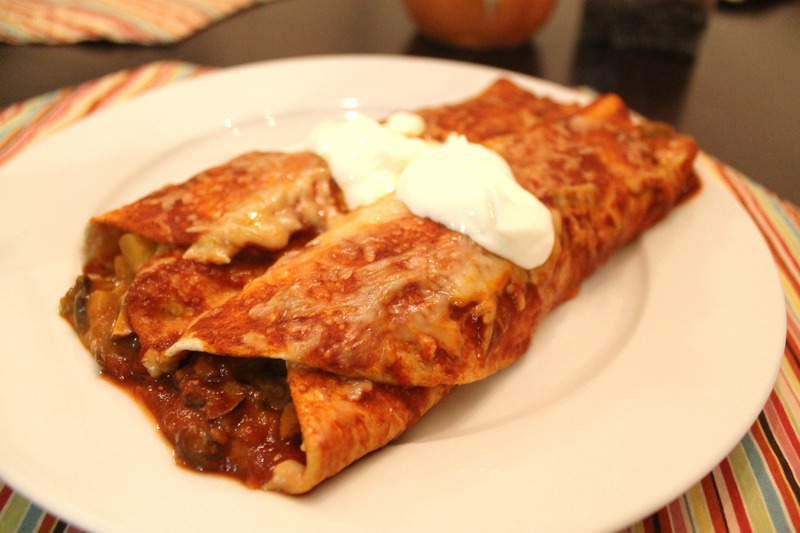 I have never met an enchilada I didn’t like, and am always trying to come up with different combinations. I think my love for Mexican food grew when I was in college. 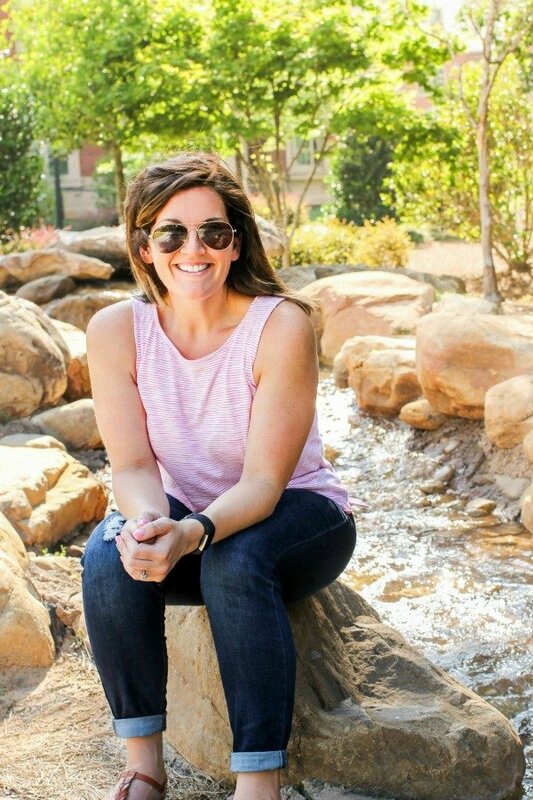 My freshman/sophomore years I worked during the summer in the best Mexican restaurant ever, Sagebrush Cantina, and got to know the food a little too well. Nachos, enchiladas, tortilla soup, sopapilla, flan, queso, flautas….I am drooling just thinking about it. The staff received a heavy discount on the food, which was prepared by a real Mexican staff (who didn’t even speak English), so it made it very difficult not to indulge in everything. The restaurant was very popular, so it was always busy, and there was always a wait which made the 10 hour shifts go by very quickly. I eventually quit, and moved away to California, but I still have a soft spot in my heart for Sagebrush Cantina, and make a point to stop by at least once when I am in Michigan visiting my parents. So, as you can probably gather, I love making Mexican food. I decided to try out some vegetable enchiladas using potato, which I haven’t tried before. I think they turned out delicious, and with the potato they were very, very filling. I had a little bit of filling left over, and my husband was happy to eat that up with tortilla chips! Top with a little sour cream or greek yogurt…..yum! 2. Heat oil in skillet, and add garlic. Cook 1 minute on medium. 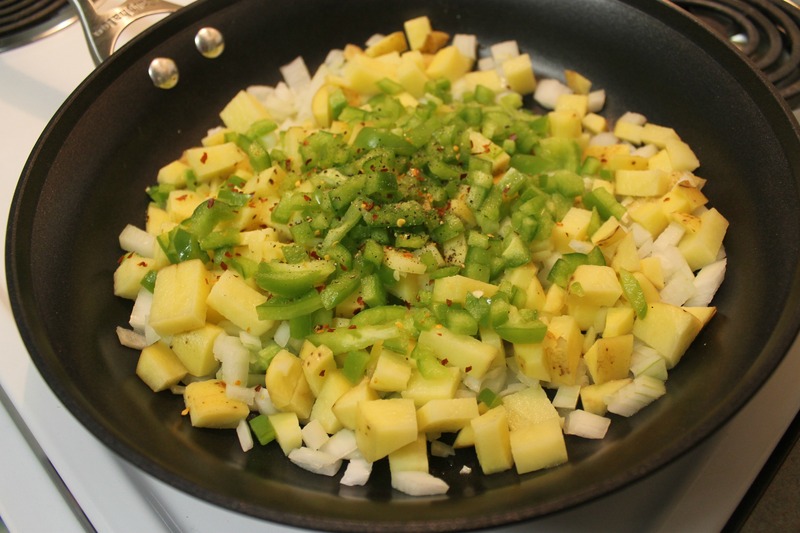 Add onion, green pepper, cumin, red pepper flakes, black pepper, and salt, and stir and cook for 1 minute. Add potatoes. Cook for about 5 minutes, until potatoes are soft. 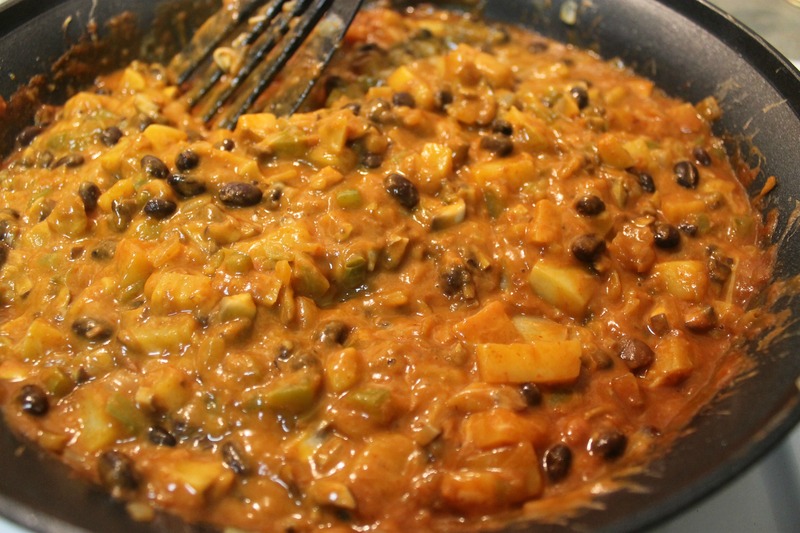 Add black beans, and refried beans and combine until well blended. Add 1/4 cup of cheese and mix. 3. Put just enough enchilada sauce in a baking dish to cover the bottom (probably 1/4 cup). Take a tortilla, fill with mixture, roll, and place into dish. 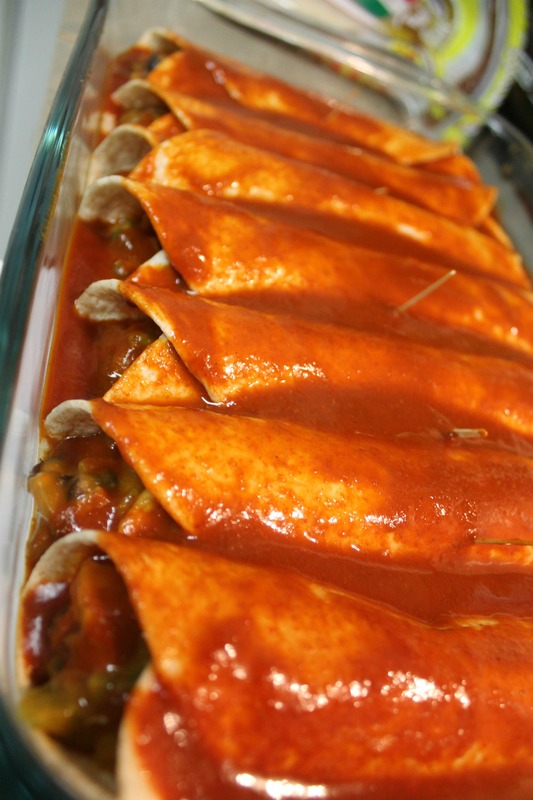 Repeat until your dish is full (they should be side by side pressing against each other), 6-8 enchiladas. Top with remaining sauce and remaining cheese. 4. Cover with foil and bake for 15-20 minutes or until cheese is melted. 5. Serve with a dollop of sour cream or greek yogurt. That would be interesting, let me know how it is! I also LOVE Mexican food. I love to make fajitas – I feel like I can make them be healthy for me and still keep the deliciousness, too! Thanks! It’s definitely a delicious meat alternative! These look so yummy! Can’t wait to try the recipe, since we love Mexican food as well. Looks yummy! When do you add the spices, like cumin and red pepper flakes? I totally spaced on that! Add them when you are cooking the onions, pepper, and potato! Okay, I updated it! Thanks again! Oh my goodness! This looks so delicious! Thank you for sharing. I love sagebrush and since I’ve moved I’ve tried to make their enchilada sauce. Is that really what they use?! If so, I’m stupid lol when I visit my parents I buy tons of it to take home with me! Hey Ashley – I am a little confused by your comment, what do you mean, “Is that what they use?” Sagebrush makes their own sauce, and I have no idea how they do it, unfortunately. Like I said in my post, the cooks are all mexican, and don’t even speak english, so it makes learning their recipes a little tricky. Where are you from?